Inspired by latkes, these patties are easy to make, pack, and eat–especially for kids (that I don’t have). It’s easy to up the flavor ante here; just add cumin, curry powder, Italian seasoning, or other spices to mix it up. 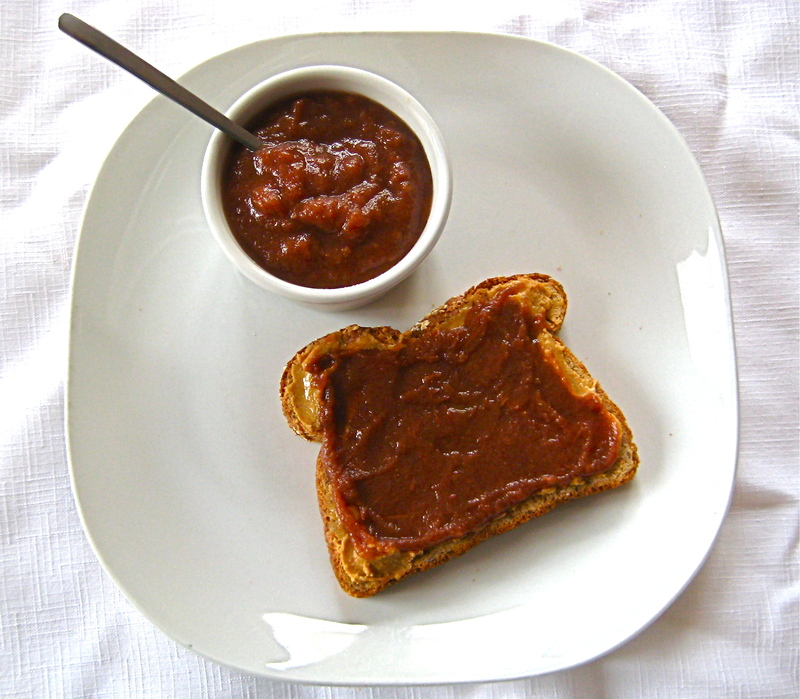 Use an apple such as McIntosh or local Ginger Gold, which makes a super quick (IE microwavable) and tasty applesauce. To make the dippers, put the warm water, flaxseed, and salt in a bowl. Let stand a few minutes, then whisk to thicken. Add the sweet potato and onion. Mix well. Stir in the tapioca flour, enough for the mixture to stick together when you squeeze it. Heat about 1 tablespoon of the oil over medium heat in a large nonstick skillet. Put a heaping tablespoon of the potato mixture on the pan. Press down with the back of a spatula. Cook for 5 minutes, until browned. Carefully flip and cook an additional 5 minutes. Let cool before packing in the lunch containers. To make a quick applesauce, put the apple and a few tablespoons of water in a small saucepan. Steam until, fork tender, about 3 minutes. Add a pinch of cinnamon. Mix well, then mash well. Pack in separate containers for easy dipping. 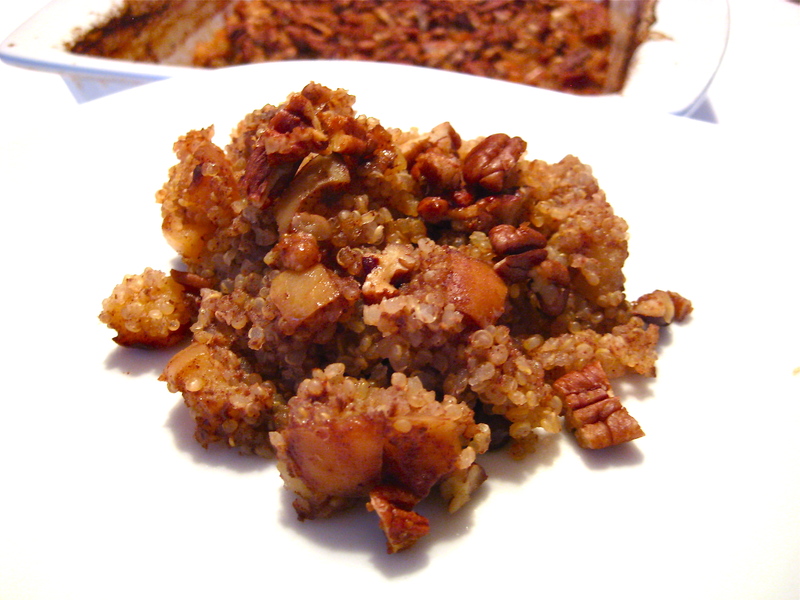 Consider quinoa as a sweet way to start the day instead of a savory side dish. Similar to baked oatmeal, this easy recipe is warms you up in the morning, while offering a balance of brain food and deliciousness, too. For a dessert, add a little extra maple syrup and a scoop of nondairy coconut milk ice cream. Preheat the oven to 350F. Lightly grease a 9×9-inch glass baking dish. Bring the milk to a boil in a medium saucepan. Add the quinoa. Return to boiling and cook for 2 minutes. Remove from heat and add the apples, raisins, maple syrup, cinnamon, vanilla, and salt. Mix well. Pour the mixture into the prepared dish. Cover with foil and bake for 15 to 20 minutes, until the quinoa is fluffy and has absorbed the milk. Put the pecans, margarine, and sugar in small bowl. Mix to completely coat the pecans. Sprinkle the mixture over the quinoa. Return to the oven and bake, uncovered, for 25 minutes longer, until the pecans are fragrant and the top is browned. Let stand 5 minutes before serving.